Inking on the Edge: My Favorite Things Stamps...Pure Innocence VIP Costumed Cuties Collection!!! My Favorite Things Stamps...Pure Innocence VIP Costumed Cuties Collection!!! Hello stampin' friends! This month MFT has a sweet treat for you! The Pure Innocence Costumed Cuties VIP kit includes 2 NEW adorable Pure Innocence stamp sets, an EXCLUSIVE Costumed Cuties Sentiments Mini set and the fabulous NEW Peek-a-Boo Trio Die-namics. The FREE mini set included in this VIP Collection is EXCLUSIVE to this VIP kit and will never be available for purchase again. 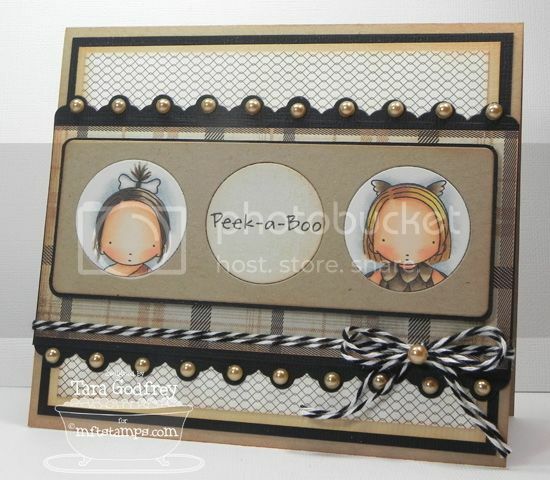 You will love the cute sentiments perfect for all your Halloween cards! So, I made 3 cards for today's Pure Innocence Costumed Cuties VIP Kit! I just adored these sweet PI Costumed Cuties and wanted to use both of them and also show you the fabulous NEW Peek-a-Boo Trio Die-namics. 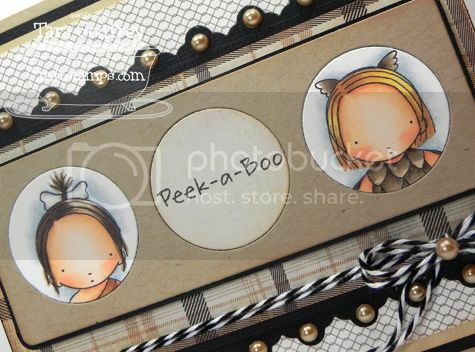 I can't wait to use this Peek-a-Boo Trio with my other PI stamps...SO many possibilities with this fun new Die-namics! I stamped and coloured the super cute Prehistoric Girl and Owl Costume girl and strategically cut them out with the Peek-a-Boo Die-namics. I also stamped and cut out a sentiment from, the EXCLUSIVE Mini Sentiments set, for the middle circle and used one of my fave border Die-namics, the new Triple Scallop Border. 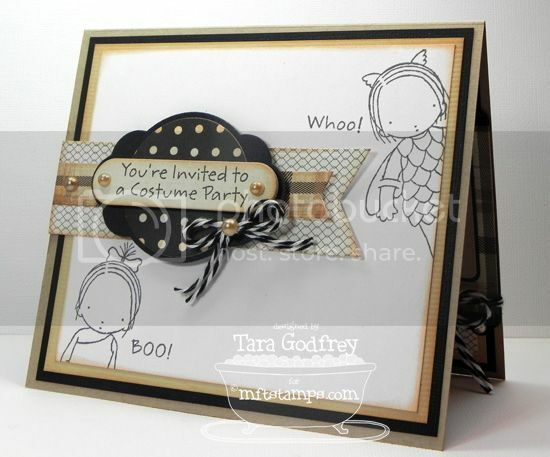 Here is the inside...I thought this card would make a fun invitation to a Halloween costume party and there is the perfect sentiment to make a party invitation in the EXCLUSIVE Mini Sentiments set. I used the Sweet Stack Die-namics and the Fishtail Flags Die-namics. This card features the precious NEW PI Owl Costume girl! I adore her to bits and had SO much fun colouring her with my Copics and adding in some ground and grass with my PrismaColor pencils. I guess this card is CAS for me as I love lots of layers and embellies and I kept this card pretty simple but I'm really happy with how it turned out. I actually used the negative Kraft cardstock circle from the Peek-a-Boo Die-namics as a tag for my sentiment and I used the Jumbo Squiggle Border Die-namics. Here is the inside...pretty simple again. I used another cute sentiment from the Costumed Cuties VIP EXCLUSIVE Mini Sentiments set and the Sweet Stack Die-namics. This card features the NEW PI Prehistoric Girl...SO sweet...she reminds me of Pebbles, smile. I coloured her with my Copics and added in grass and some stones with my PrismaColor Pencils. I really wanted to give her a leopard skin dress and this BasicGrey Little Black Dress paper pad that I used on all these cards had the perfect paper in it! Again, I used the negative Kraft circle cut from the Peek-a-Boo Die-namics to make a tag and stamped a few "dinosaur" tracks on the tag with the included accessory stamp. Here is the inside...I made a few more "dinosaur" tracks with wee accessory stamp from the Prehistoric Girl Stamp set. I think you could also use this stamp to create a leopard patterned dress for her. Well, thanks SO much for stopping by and having a wee peek at my cards for this month's Pure Innocence Costumed Cuties VIP Collection. 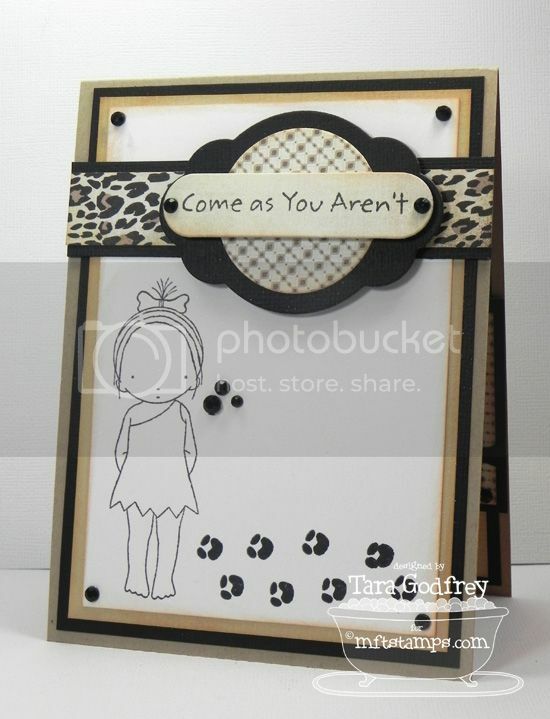 Now, take a swing by Kim's blog for links to all the MFT Designers with cards and fun creations using the new VIP collection. Now, every month the VIP flies of the shelves so don't miss out of this must-have collection after you visit Kim's blog swing on over to the MFTstamps!!! beautiful work, Tara! your coloring is amazing. these couldn't be cuter! Always so many FABULOUS details, Tara! Each card is just adorable! LOVE the papers you used. You seriously have me rethinking Basic Grey! OMGoodness! What gorgeous cards, Tara! OMGosh these are so great! Brilliant card design, I just love them and the dp goes so perfect with them. Tara these creations are CRAZY stunning!! So inspiring and totally gorgeous!!! Hope you're having a great end of summer!! Fabulous!, great papers , awesome coloring and totally amazing layouts! Oh dear Tara! What cute and detailed cards! I love all the layers and your coloring is out of this world! Thanks for the inspiration! These little cuties look like they're having SO much fun!!! Amazing cards!! Seriously wonderful projects Tara!! So many wonderful details. I love your beautiful projects, Tara! WOWZERS!!!! All the cards are Amazing!! I love this kit a lot and purchased mine last night!!!!! These are simply AMAZING! I just LOVE LOVE LOVE all of these! Your coloring is seriously INSPIRING and I LOVE all your layouts and layers!! Wow!!! These are all fantastic!! Your coloring rocks!! Outstanding coloring and paper choices! Love your work!